Freeze-dried Pure New Zealand Manuka Honey certified UMF® rating 16+. It's exactly the same high quality Pure Manuka Honey as we sell in jars. The unique properties help support the immune system and enhance general well-being. 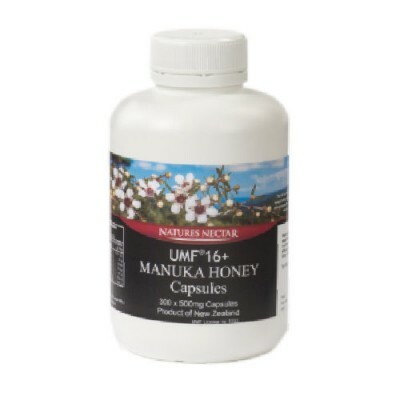 The UMF® Manuka Honey used for these capsules has been independently tested by a laboratory licensed by the Honey Research Unit of the University of Waikato and are imported direct from New Zealand in tubs of 300. It is a premium product with exceptional qualities and the excellent antibacterial strength of 16+ is one of the higher strengths available. Even though most people think Manuka honey tastes great, some people just aren't partial to the taste of honey in general so, this is an excellent way of ensuring those people can still benefit from all the advantages of Pure Manuka Honey. Each 500mg capsule contains 200mg of superior grade freeze-dried Manuka Honey, equivalent to 400mg of liquid honey. The capsules are produced from exactly the same honey as we sell in jars. We recommend up to 3 x 500mg capsules, three times per day. However, it largely comes down to some self judgement on how much to take and how often: more often for an immediate issue, less often if it is not so severe. How do they ‘dry’ Manuka Honey? To make the dry form of Manuka Honey, the process of Accelerated Freeze Drying (lyophilisation) is used. It is the same process that is used for high value pharmaceuticals as it is the gentlest drying method for biological materials. It operates at very high vacuum (very low pressure - less than 1mbar which is 1000th of atmospheric pressure) on the principle of operating below the eutectic point of water. The low pressure changes the physical properties of water. At that pressure, water can only exist as a solid (ice) or a gas (water vapour). Gentle heat is applied (about 35 deg C) so that the product does melt but remains in frozen form as the water content is removed as vapour. Consequently, the cell structures - intracellular components and cell walls - are not damaged. What is the difference between ‘Active’ and ‘UMF’ Manuka Honey? UMF® is an abbreviation which stands for Unique Manuka Factor. UMF® is a phytochemically derived antibacterial property (i.e. it is derived from the nectar of the flower) found in some types of Manuka Honey. The UMF® activity exists in addition to the hydrogen peroxide antibacterial activity found in all honeys (this activity is due to an enzyme which is added to the nectar by the honeybee). These two antibacterial activities work synergistically - enhancing their effects.